A solid-fueled satellite launcher backed by a Chinese start-up named LandSpace fired away from the Jiuquan space center in the Gobi Desert Saturday on its inaugural flight, but the rocket failed to place its microsatellite payload into orbit. The three-stage Zhuque 1 rocket lifted off at 0800 GMT Saturday (4 a.m. EDT; 4 p.m. Beijing time) from an unidentified launch pad at Jiuquan. Video recorded of the launch and broadcast on Chinese state television showed the slender rocket, with red and white markings, arcing downrange from Jiuquan, leaving a twisting exhaust plume in a clear afternoon sky as spectators cheered. The lower two stages of the Zhuque 1 rocket functioned as designed, and the launcher’s payload shroud jettisoned as programmed, LandSpace said in a statement. But the rocket faltered as its third stage fired to accelerate into low Earth orbit. 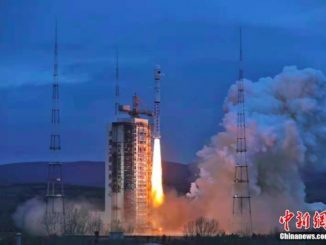 The Zhuque 1 rocket aimed to place the Weilai 1 microsatellite into orbit for China Central Television, the country’s government-run TV network. The satellite weighed less than 100 pounds, and was intended to collect imagery for use in television broadcasts. Standing 62 feet (19 meters) tall with a diameter of 4.3 feet (1.3 meters), the Zhuque 1 rocket is powered by three solid-fueled rocket motors. According to information published by LandSpace, the launcher can place a 440-pound (200-kilogram) payload into a 310-mile-high (500-kilometer) sun-synchronous orbit. The Zhuque 1 weighs nearly 60,000 pounds (27 metric tons), and its first stage generates nearly 100,000 pounds (45 metric tons) of thrust. LandSpace is developing a liquid-fueled rocket named the Zhuque 2, which could be ready for a test launch in 2020. The Zhuque 2 will be powered by engines burning methane and liquid oxygen that are capable of deep throttling, allowing the first stage to return to Earth for vertical landings and reuse. LandSpace has outlined future plans to develop two- and three-stage versions of the Zhuque 2. 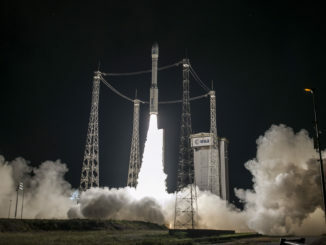 The basic two-stage configuration will stand 160 feet (48.8 meters) tall and produce around 590,000 pounds (268 metric tons) of thrust at liftoff, with a payload capacity of around 3,968 pounds (1.8 metric tons) to a 310-mile-high sun-synchronous orbit. A heavier-lift version known as the Zhuque 2C, comprising five first stage cores bolted together, will be able to haul more than 70,000 pounds (32 metric tons) to a 120-mile-high (200-kilometer) low Earth orbit, according to LandSpace. 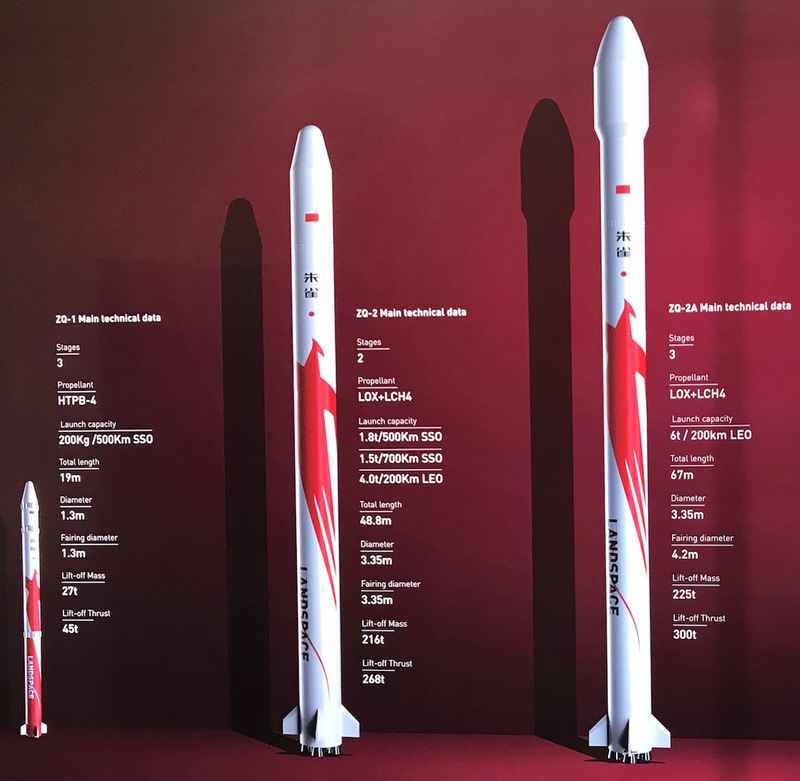 In a statement released after Saturday’s launch, LandSpace emphasized lessons learned during the development of the Zhuque 1 rocket, and vowed to continue with more launches in the future. Saturday’s launch was China’s 30th space launch attempt of the year, and the country’s first launch failure in 2018. 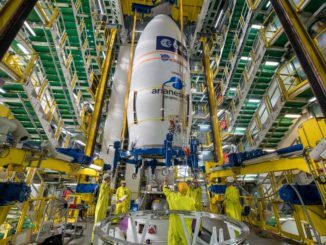 Numerous Chinese private space initiatives took off in the last few years, and a report by the space investment firm Space Angels earlier this month said $217 million was invested in Chinese private space companies in the first three quarters of 2018. That’s a fraction of the global investment in private space companies, but the industry’s growth in China has almost exclusively occurred since 2016. 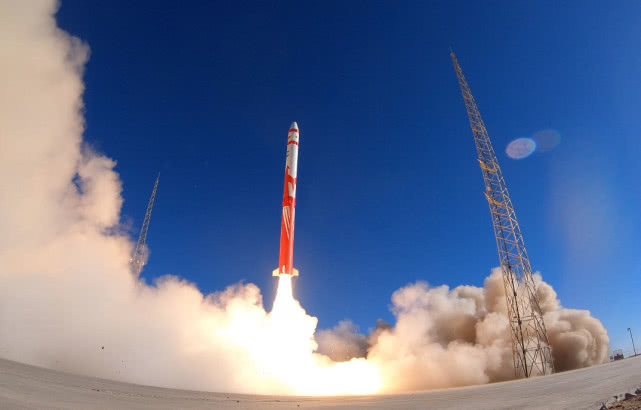 Chinese satellite companies have developed and launched small spacecraft in recent years, and China’s private launch industry has accomplished several suborbital rocket flights, including successful demonstrations by iSpace and OneSpace, two of LandSpace’s domestic competitors in the commercial launch market. But LandSpace was the first privately-funded Chinese company to reach the launch pad for an orbital mission. The commercial launch industry in the United States includes established players such as SpaceX, and companies with rockets sized to carry smallsats into orbit include Rocket Lab — a U.S.-New Zealand launch provider that reached orbit for the first time earlier this year — and Richard Branson’s Virgin Orbit, which is nearing its first orbital launch. China’s launcher programs have been be the exclusive realm of state-owned enterprises since the dawn of the country’s space program. The China Aerospace Science and Technology Corp., or CASC, is the lead designer and manufacturer of the Long March family of rockets used to send nearly all of the country’s satellites into orbit. China’s government-owned space companies have also debuted new families of launchers in the last few years, including the heavy-lift Long March 5 and medium-class Long March 7 rockets. Other new Chinese rockets that have launched for the first time since 2013 include the Long March 6, Long March 11 and the Kuaizhou rocket family, all designed to deliver smallsats to low Earth orbit. The Kuaizhou rocket series is operated by Expace, a commercial arm of the state-owned China Aerospace Science and Industry Corp.